One of the sweetest perks of living in a city by the sea is being able to escape the noise, exhaust, and hoards of people by getting out on the water. And when 4th of July rolls around? The night skies and their reflections on the water are absolutely stunning. Get your plans for the 4th squared away early! Check out these boating safety tips and see the best spots to watch the fireworks by boat. Be wary of boating and drinking, particularly when compounded by sun and a long day on the water. If you need spare life jackets for your extra July 4th stowaways, borrow one from the BoatUS Foundation’s Kids’ Life Jacket Loaner site. Keep your boat afloat! A good rule of thumb for boat capacity: make sure everyone has a seat. Stay untangled & charged: TowBoatUS reports that many July 4th assistance calls are for anchor line disentanglements and battery jumps. Paddle safe: Navigation lights apply to SUP boards. Stay visible and avoid congested boat areas. Ready to make your plans? Read on for fireworks shows near you. This post was originally published June 2016 and updated in 2017 and on 5/29/18 with current-year dates and additional events. You'll notice we credit some boaters in this post – to share your event, chime in on Facebook! Kennebunk: While only home to about 3,500 year-round residents, Kennebunkport is known for having some of the best displays in the state. Kennebunk and Kennebunkport team up each year to set off a spectacular show from Narragansett Point, between Gooch’s and Middle beaches. The show starts at 9PM on Wednesday, July 4th, and the best spot by far to watch is from on the water. Portland: July 4th, 9PM over Kennebunk Beach. Ogunquit: July 4th, 9:15PM from Ogunquit Beach. Bar Harbor: July 4th, 9:15PM over Frenchman Bay. Camden: July 4th from Camden Harbor around 9PM. York: July 4th, 9PM at York Public Beach & Park on York Street. 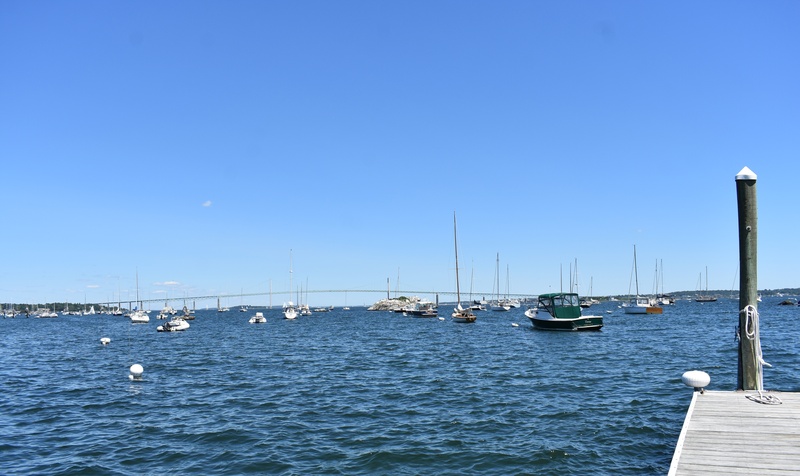 Portsmouth: As a major coastal town in one of the original Thirteen Colonies, in a state whose slogan is Live Free or Die, it's safe to say Independence Day means a lot to the people of Portsmouth, New Hampshire. Every year the City of Portsmouth holds their 4th of July Fireworks on July 3rd. You can watch from South Mill Pond around 9:15PM to see the sky light up with fireworks. Alton Bay: July 3rd at 9:20PM over the bay. Bristol: July 3rd at dusk from the foot of Newfound Lake. Hampton: July 4th from 8:15-9:30PM from Hampton Beach. Center Harbor: July 4th over the harbor at dusk. If you're out nightsailing 4th of July weekend on the coast of Massachusetts – and in particular out of Boston or the North or South Shore – you're guaranteed to see some shows. NEW Boston: June 8 @ 9:30PM over Columbia Point – click here for the Facebook event with more info. NEW Hull: June 23rd, 2018 at 9:30PM from a barge off Nantasket Beach. NEW Oakham: July 1st at 9:30PM off a barge on Lake Dean. Orleans: July 1, 2018 at dusk. You can see the Rock Harbor fireworks display from Cape Cod Bay beaches in Brewster and Eastham. Hingham: July 1, 9:30PM from Button Island over Hingham Harbor. NEW Swampscott: July 3rd around 9PM over Nahant Bay. NEW Milford: July 3rd at 10PM at Plains Park. NEW Manchester: July 3rd, 2018 from a barge off Singing Beach around 9:15PM. NEW Sharon: July 3rd, at 9:30PM from a barge on Lake Massapoag. Gloucester: July 3, 8:30PM over Gloucester Harbor. Lynn: July 3, 9PM from a barge near Red Rock. Weymouth: July 3, 9:30PM at either George Lane Beach in North Weymouth or from a barge off Wessagusset Beach. 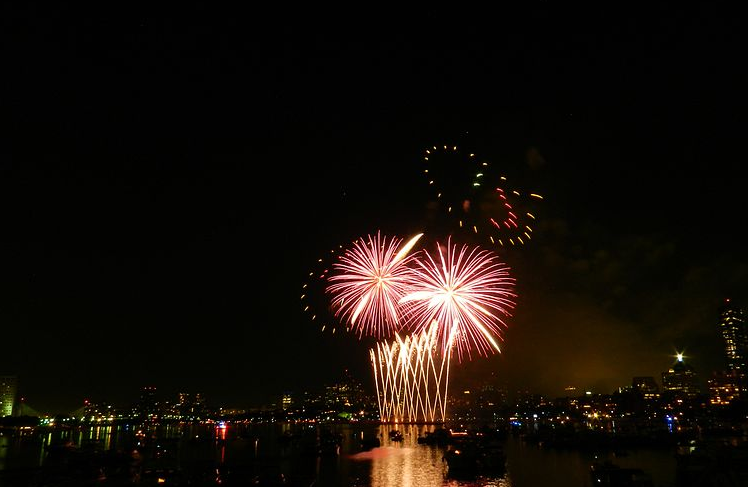 Boston Harbor: July 4, 10:30PM as part of Boston Pops Fireworks Spectacular. Head there around 8PM to hear the concert before the fireworks show begins! 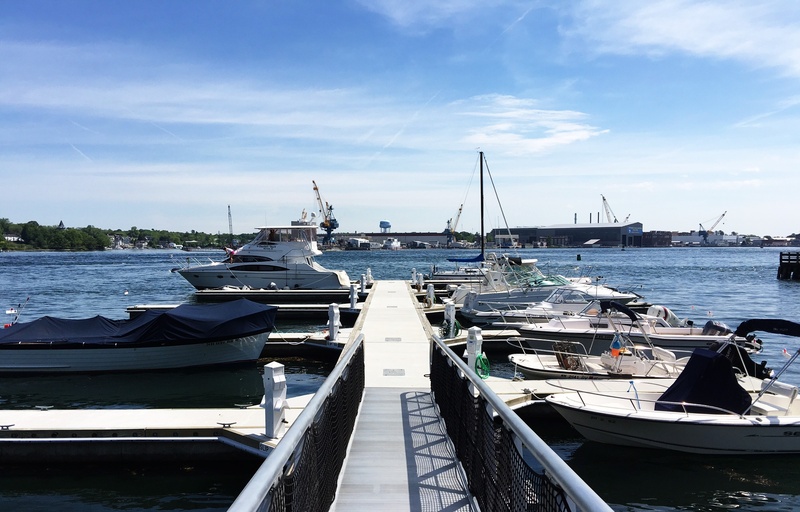 Quincy: July 4th Bay Pointe Waterfront Restaurant which is right next to Baypointe Marina will be hosting fireworks for the City of Quincy. Martha's Vineyard: July 4, 2018 as darkness falls over Edgartown Harbor. Nahant: July 4, 9PM from Bailey’s Hill Park. Plymouth: July 4, 9:15PM on the Plymouth Waterfront. New Bedford: July 4th at 9PM from a barge off the State Pier. Marblehead: The 2018 fireworks are scheduled for July 4th at 9:15PM. The Harbor Illumination will begin at 9PM in Marblehead Harbor. Fall River: July 4, 9PM at Battleship Cove. Hyannis: July 4th over Lewis Bay at dusk. Salem: July 4th at 9:15PM. The fireworks are launched from Derby Wharf accompanied by live music from the orchestra! Provincetown: July 4th aroung 9PM from Provincetown Harbor & MacMillan Pier. NEW Edgartown: July 4th 9:15PM from Edgartown Harbor. NEW Yarmouth: July 4th at 8PM at Seagull Beach. NEW Wakefield: July 4, around 9PM on Lake Quannapowitt . Get there around 4:30PM to enjoy the Wakefield annual Fourth of July Parade! NEW Springfield: July 4th around 9:30PM at Riverfront Park. NEW Salisbury: July 4th 2018 at 9:30PM from Salisbury Beach. NEW Marion: July 4th around dusk. The Fireworks display will be at Silvershell Beach! NEW Cohasset: July 4th around 9PM at Sandy Beach. NEW Chatham: On July 4th, the Chatham 4th of July parade is happening from 9:30-11:30AM with the theme "Hooked on Chatham." The fireworks begin at dusk over Midnight Oyster Pond. NEW Barnstable: July 4th 2018, at 9PM over Lewis Bay. NEW Westboro: July 4th, at 10PM. Fireworks are shot from Chauncy Street Boat Ramp. Nantucket: July 5, 9PM from a barge by Jetties Beach. Don't see your town on this list? Check out all the Massachusetts Fourth of July fireworks shows here! Block Island: July 2nd, at 9PM from Town Beach Pavilion. Jamestown: July 2, 9PM over Newport Harbor and Narragansett Bay. Warwick: July 3, 9PM from the Oakland Beach seawall. Bristol, RI Fireworks: July 3, 9:30PM from Independence Park. Get there early and stroll over to the concert series downtown! Newport: July 4, 9:15PM over Newport Harbor. Providence: July 4, 2018, the city of Providence will celebrate the fourth of July with fireworks, food, music and more at Indian Point Park around 7PM. NEW Westport: Westport POlice Athletic League Fireworks at Compo Beach on July 2nd at dusk. NEW Norwalk: Fireworks and entertainment at Calf Pasture Beach. Festival starts at 5:30PM with fireworks at Dusk on July 3rd. NEW Stratford: Fireworks at Short Beach Park at 7PM on July 3rd. Madison: July 3rd, 9:30PM held on waterfront area off West Wharf Beach. Fairfield: July 5th around dusk from either Penfield or Jennings Beaches. Music begins around 5PM at Jennings Beach! New London: July 14th 2018, the Waterfront Park and State Pier Fireworks Extravaganza begins at 9PM. NEW Rowayton: Rowayton Civic Association Fireworks at Bayley Beach on July 4th at 9:15PM. If you're heading to the jersey shore for 4th of July weekend this year there are some great festivities planned! Take a look at some the shows below and book your Independence Day weekend now. Lavallette: July 1st, 8PM at Lavallette Gazebo. Manasquan: July 3rd, at dusk on the beach. Ocean City: July 4th, 9PM at Ninth Street Beach or the Ocean City Music Pier. Beachwood: July 4th, at dusk at Bayside Ave.
Point Pleaseant: July 4th, at dusk at Jenkinson's Boardwalk & Beach. Barnegat: June 30th, at dusk from Barnegat Municipal Dock. Seaside Heights: July 4th, at 9PM from Seaside Heights Boardwalk & Beach. Asbury Park: July 4th at 9PM over the ocean. Atlantic City: July 4th at 10PM over the beach and boardwalk. Toms River: July 4th, 2018 at 8PM over the river. 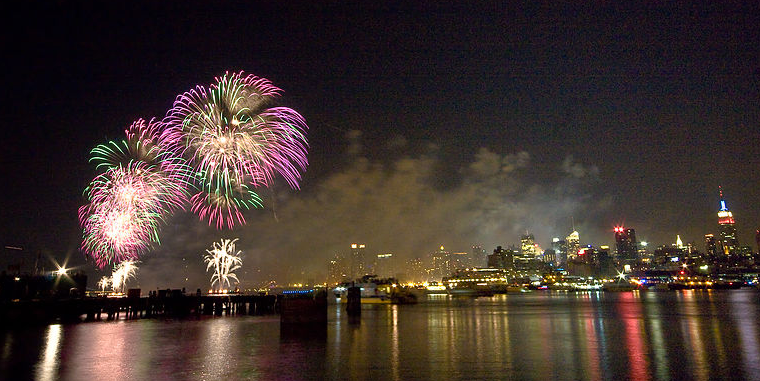 Jersey City: The 5th annual Jersey City Freedom fireworks festival takes place at Exchange Place on the Hudson River. The festival takes place on July 4th from 12-10PM with fireworks beginning around 9PM. Cape May: July 7th at dusk fireworks over the ocean. Since I was 7, (61 years ago LOL) I have been going by boat into the Toms River where the small town of Beachwood puts on a fireworks show that is awesome. There are close to 700 boats anchored up in the River which in itself is a stunning sight. Many thousands more view from rooftops and beaches along the River. Now my children bring my grand children home for the show. In December Joni and I moved to Bethany Beach, DE, but will make the trip back to Toms River in our 44' Ocean for the 4th. It's a 5-hour boat ride, but we will not only be with family and friends, but continue a lifelong family tradition of Fireworks on the River. I have missed less than 6 for various reasons over the years and still thrills me. Toms River fireworks are traditionally held on the 4th. Keep an eye on the Toms River town website. Southampton: June 30th at 7PM the Annual American Picnic with Fireworks will take place over Shinnecock Bay. Sag Harbor: On July 1st, the fireworks will be viewable from Haven's Beach at dusk. Amagansett: July 1 at 9:15PM over Fresh Pond Beach. Oakdale: July 3rd at 9:15PM over Connetquot River. Riverhead: July 3 at 9PM over the Peconic Riverfront. NEW Clayton: The Clayton Town Fireworks are being held on July 3rd around dusk. They will be set off to music in front of Calumet Island and viewable from Riverside Drive. Need to reserve somewhere close by after the fireworks? 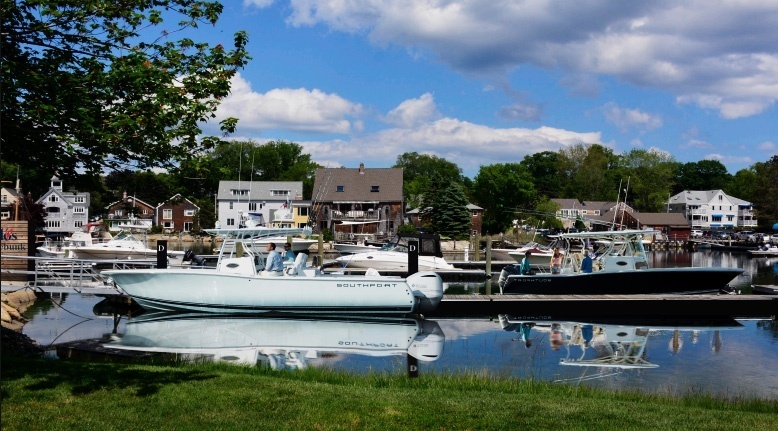 Be sure to check out Clayton Harbor Municipal Marina! Port Jefferson: July 3rd at 9:30PM over East Beach. Montauk: July 4th at 9PM at Umbrella beach. New York City: The Macy's pyrotechnic spectacular bursts over the East River on July 4th at 9:20PM. The fireworks are set off from barges located on the East River spread between 24th and 41st streets. Wantagh: July 4th at 9:30PM over Jones Beach. Shelter Island: July 7th at 9:30PM over the beach. East Hampton: July 15th at 9:30PM. The fireworks will be viewable from Three Mile Harbor! Chesapeake Bay pulls out all the stops, with booms and sizzles ricocheting around the water for three nights in a row! 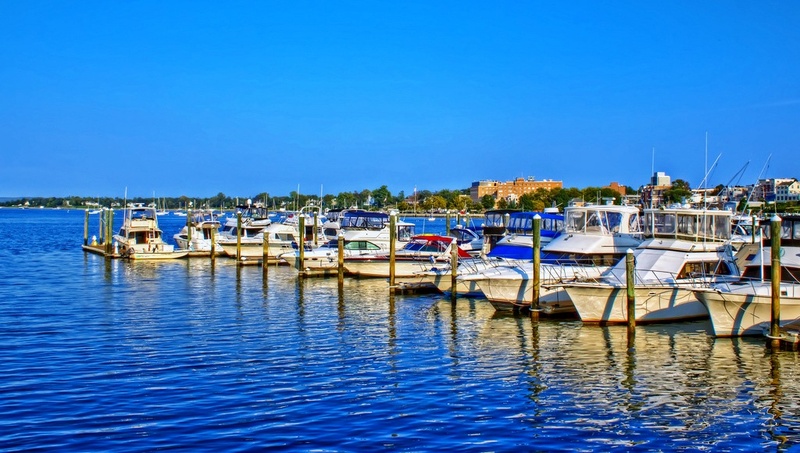 From Havre de Grace to Cape Charles, you'll find a Dockwa marina ready to make you feel at home for the Fourth! Middle River: June 30th at dusk. Fireworks take place off Wilson Point. Havre de Grace, MD: July 1st, 9PM from the island at Tydings Park. Rock Hall, MD: July 3, 9PM over the harbor. Annapolis: July 4, 9:15PM from Susan Campbell Park. Get there by 8PM for the Naval Academy's Concert Band performance. Baltimore: July 4, 9:30PM over the harbor. Go around 7PM for a concert by the U.S. Navy Band at the Inner Harbor Amphitheater! Cape Charles, VA: July 4th, after dark over the harbor. Solomons Island, MD: July 4th, between 9:15-9:30PM. Independence Day celebrations can be found throughout the state. Enjoy food, live entertainment and the colorful firework displays. Charleston: Spend July 4th in Chucktown and catch the fireworks – their largest show to date – and live music starting at 9:10PM. The party starts at 3PM at Riverfront Park in the city of North Charleston with musical guests, children's activities, food trucks, and craft vendors. Book your slip and join the fun! 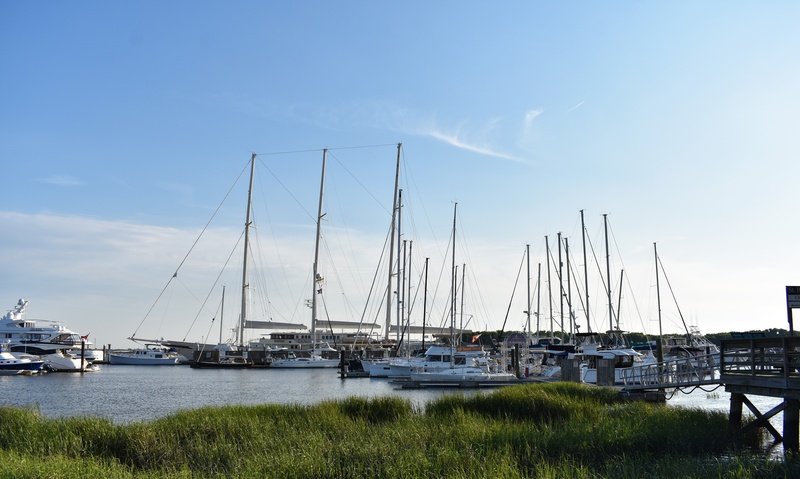 Hilton Head Island: July 4th, the Harbour Town Fireworks Extravaganza begins at 9PM! Myrtle Beach: On July 4th, 2018, Murrells Inlet fireworks begin at 10PM. 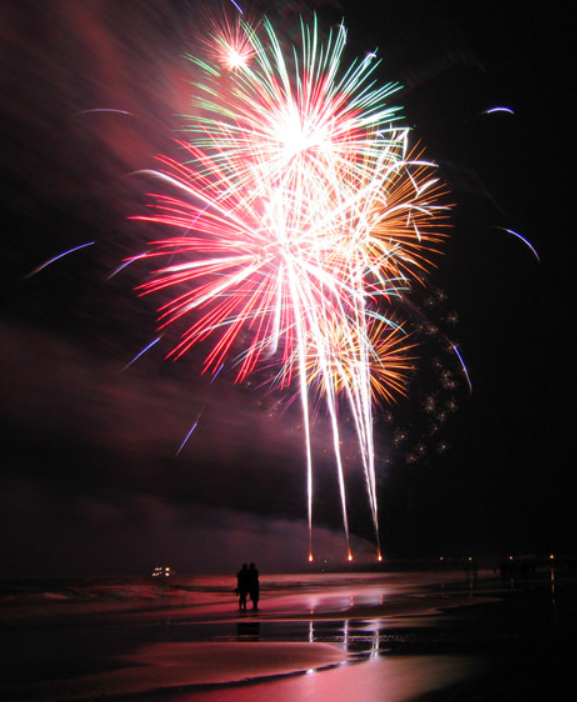 North Myrtle Beach: On July 4th the fireworks display can be seen from Cherry Grove Pier around 9:30PM. Lake Broadway: On July 4th you can see the fireworks over the lake at 10PM. NEW New Bern: The City of New Bern is planning an exciting July 4th celebration. Fireworks begin at 9:15PM at Lawson Creek Park. Come earlier to make it a day full of fun along the riverfront! NEW Darien: On June 30th, the Red, White and Blues on the Bluff festival begins at 5:30PM with the fireworks beginning after dark over the Waterfront Park. NEW Blue Ridge: On July 1st, the Lake Blue Ridge Fireworks begin at dark by the Lake Blue Ridge Marina. Jekyll Island: Another spot in Georgia to see the fireworks for the fourth on July 3rd, beginning at 9PM. Tybee Island: July 4th, 9:15PM. Fireworks will be launched from Tybee Beach Pier and Pavilion over the water! NEW Albany: On July 4th, the downtown concert and fireworks are held at the Riverfront Park. The concert begins at 5PM with the fireworks starting at 9:30PM. Savannah: While the fireworks turn up the heat in Savannah, you can be sitting pretty with a front row seat right on the water! Fireworks begin at 9:15PM over the water by Tybee Island. NEW Detroit: On June 25th the Ford Fireworks show takes place at the Detroit River at 9:55PM. Bay Harbor will host the Petoskey Steel Drum Band beginning July 3rd at 8PM. Enjoy food trucks and other special offerings. 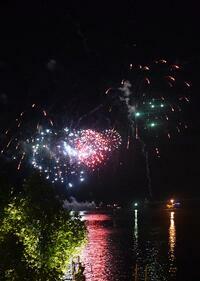 An unparalleled fireworks display over Bay Harbor Lake will commence at dusk. Chicago: When the city of Chicago canceled its fireworks show in 2011, Navy Pier took up the helm and has been Independence Day central ever since. A patriotic soundtrack blares as fireworks rocket overhead. 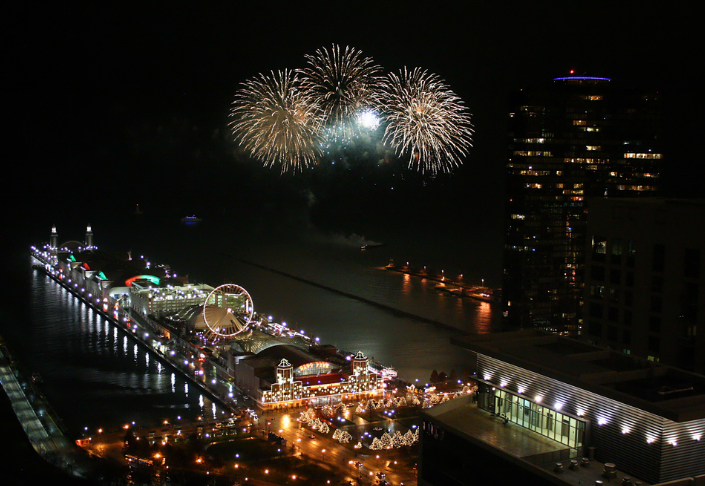 Book a slip on Navy Pier or at a nearby Dockwa marina, and watch the fireworks over the water on July 4th, at 9:30PM! Center Lake: On July 3rd the boat parade starts around 1PM with fireworks after dark over the lake. Saginaw: July 4th at 10PM along the river! New Orleans knows how to throw a good party. If you're in the area, get in on what is sure to be a borderline-insane celebration of our nation's independence. 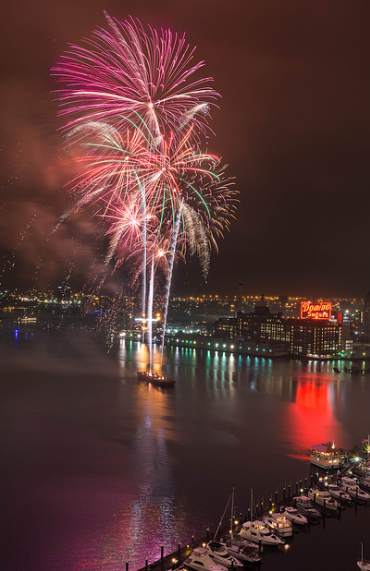 Weather permitting, the fireworks display begins aboard “dueling barges” anchored at mid-river on July 4 at 9PM, and can be viewed from either side of the river. Baton Rouge: July 4th over the Mississippi River at 9PM. Lake Charles: July 4th, 9:15PM over Lake Charles during the Red White and Blue & You Parade. Shreveport-Bossier: July 4th the Rockets over the Red Fireworks Festival begins at dusk! South Padre Island: Officially designated the "Fireworks Capital of Texas," South Padre Island hosts a fireworks extravaganza over Laguna Madre Bay at 9:15PM on July 4th. Starnes Island: July 3rd at 8:30PM over Lake Travis just offshore from VIP Marina and Beachside Billy's. 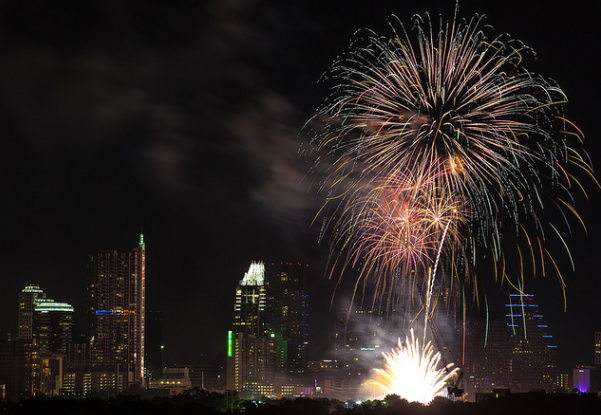 Austin: H-E-B Austin Symphony Orchestra performs the annual 4th of July fireworks & symphony at Vic Mathias Shores at 9:30PM. San Antonio: Catch the 4th of July fireworks show at Woodlawn Lake Park starting around 8:45PM. Marble Falls: Over the Lake at Lakeside Park on July 4th, 2018 there will be a 20 minute firework show starting at dark! Lago Vista: July 4th at 8:30PM over Lake Travis by Bar K. Park. Gulf Shores: July 4th, 2018 at 9PM fireworks will be shot off from the Gulf State Park Fishing and Education Pier over Gulf Shores Public Beach. Orange Beach: On July 4th a fireworks display will be launched over Perdido Beach at dusk. Get there around 6PM to see the Mixed Nuts performing live on the Beach Deck of Perdido Beach Resort! Cullman: July 4th at 9PM the fireworks will be launched over Lewis Smith Lake. Ocean Springs: Watch the fireworks over the beach on July 3rd around 8:45PM at Fort Maurepas Park. Biloxi: July 4th, 2018 fireworks will begin at 9PM at Biloxi Small Craft Harbor. The fireworks will be fired from a barge near Deer Island. Waveland: The Independence Day Celebration will be held July 4th, beach-side starting at 5PM with fireworks beginning at 9PM. July 3rd- there will be a free 'One Nation Under God' Concert by the Cherokee National Youth Choir from 6-7PM. NEW Heber Springs: The 2018 Fireworks Extravaganza in Heber Springs will take place Tuesday at Sandy Beach on Geers Ferry Lake. Gates open at 10AM and people can arrive by boat or by car for a day of fun before the live music, provided by the 106th Army Band Charlie Rock at 7:30PM and fireworks over the lake at 9:30PM. NEW Greers Ferry: The Greers Ferry City Fireworks, hosted by the Greers Ferry Chamber of Commerce, will take place at 8:30PM on July 4th at Greers Ferry City Park. There will be free hot dogs! NEW Pangburn: July 4th at Pangburn City Park from 9-9PM. The schedule for the day includes a parade, a horseshoe-pitching contest, free BBQ dinners, the Luke Williams Band and fireworks! NEW Paducah: July 4th from 4-10PM with fireworks beginning at dusk! Cocoa Beach: A three day fireworks display will be held on July 3rd at 9:30 PM over the Harbor; on July 4th at 8:45PM over the Indian River Lagoon; and on July 5th at 8:45PM over the ocean. Tampa: July 4th at 8:45PM over the Channelside Bay. Deerfield Beach: July 4th at 9PM at the Beach. Fort Lauderdale: The 4th of July Spectacular takes place on the 4th of July with fireworks over Fort Lauderdale Beach beginning at 9PM. Pompano Beach: the July 4th Fireworks Extravaganza is being held on July 4th with fireworks beginning at 9PM. They are being launched by the end of the Pompano Beach Fishing Pier. Delray Beach: July 4th at 9PM. Fireworks launch from the north end of the beach. West Palm Beach: An 18-minute firework extravaganza over the Inter-coastal begins at 9PM on July 4th. Miami: Fireworks are shot off barges in Biscayne Bay at 9PM on July 4th. Pensacola: Fireworks begin at 9PM over Pensacola Bay on July 4th. Fort Myers: The Fort Myers Beach fireworks will begin at 8:45PM on July 4th over the ocean. 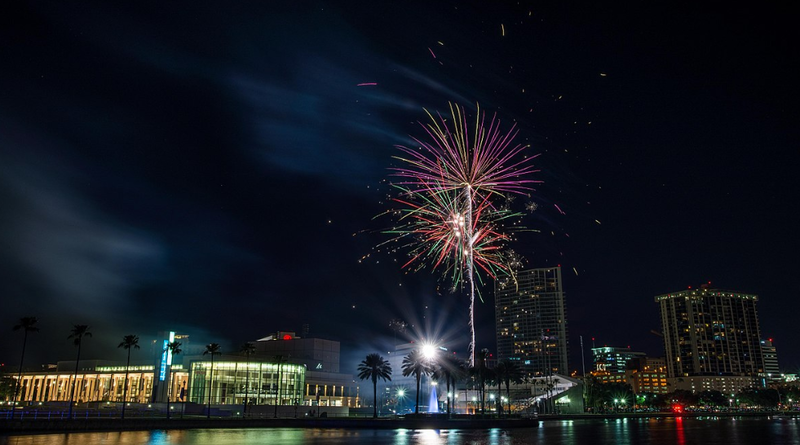 Orlando: Fireworks at the Fountain will take place on July 4th at 9:10PM at Lake Eola Park. Seattle: Enjoy the fireworks display at Gas Works Park on July 4th 2018 at 10:20PM over Lake Union. SeaTac: July 4th at 10PM at Angle Lake Park. 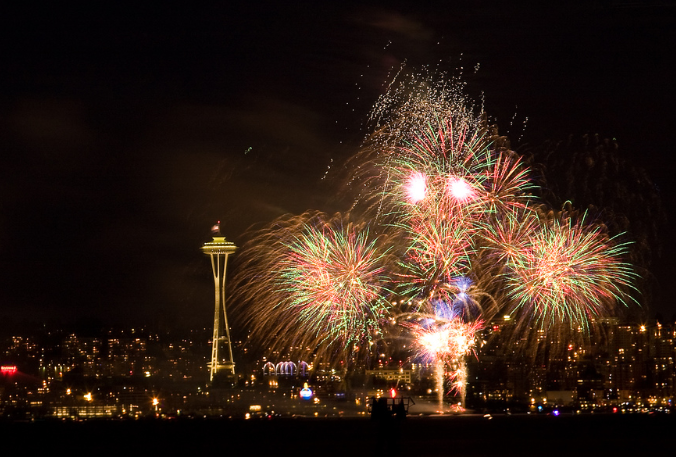 Everett: July 4th,10:20PM watch the fireworks display over the Puget Sound. Des Moines: July 4th at 10:20PM, view the fireworks over the Puget Sound. Newport: July 4th at 10PM over Yaquina Bay. Portland: Enjoy the 4th of July fireworks at the Waterfront Blues Festival show on July 4th at 10:05PM. Seaside: July 4th, at 10PM over the Seaside Beach. Wallowa Lake: on July 4th, 2018 the Shake The Lake 4th of July Fireworks will be held at the north end of the Lake at 9PM. Astoria: July 4th at 9:50PM, fireworks will be launched from the East End Mooring Basin over the Columbia River. Grand Lake: The Grand Lake 4th of July Fireworks Extravaganza is ranked as "one of the best fireworks shows in the nation." Be sure to watch the fireworks over the lake on July 4th at 10PM! Estes Park: July 4th, 2018 at 9:30PM over Lake Estes. Loveland: July 4th celebration at North Lake Park with the fireworks starting at 9:17PM over the lake. Frisco: July 4th fireworks over Dillon Reservoir with fireworks starting at 9:30PM. July 3rd at 9PM over the ocean! The event kicks off at 6PM with food trucks parked on Rancho Del Oro Road. Yankee Doodle Dinghy Parade at Oceanside Harbor will take place from 1-3PM on July 4th. For its 16th year in a row, this event allows participants to decorate their dinghies in patriotic themes and parade them around the inner harbor. All are welcome to participate. San Francisco sets off twin 4th of July fireworks displays from Aquatic Pier just below Ghirardelli Square and from a barge near Pier 39 on July 4th at dusk. A prime spot to see the fireworks display from these locations would be around Treasure Island! Check out more information regarding the celebration at the pier here! South Lake Tahoe: On July 4th, Lights on the Lake at South Lake Tahoe is known as one of the largest and best Independence Day fireworks displays in the country! The fireworks show starts around 9:45PM and we think out on the water is the best way to view it. Incline Village On July 4th at 9:30PM. Lake Tahoe's North Shore hosts the Red, White, and Tahoe Blue fireworks display that is one you don't want to miss! Lake Oroville: On July 4th, Lake Oroville in Northern California hosts a fireworks show over the lake in the Sierra Nevada foothills starting at 9PM. Marina Del Rey: hosts the "best fireworks display on the Westside" on July 4th at 9PM. Click the link to reserve your spot through Dockwa today! On July 4th, 2018 a Southern California fireworks display goes off at Newport Dunes Resort after sunset. On July 4th from 1-3:30PM the Old Glory Boat Parade is taking place at Collins Island and will continue through the Newport Harbor. Boaters are invited to decorate their boats in pride and patriotism for the holiday celebrations! NEW Imperial Beach: Imperial Beach Independence Day Fireworks at 9PM on July 4th. NEW Laguna Beach: Fireworks will take place at Monument Point at Heisler Park on July 4th at 9PM. NEW Dana Point: The Dana Point Independence Day Fireworks Extravaganza at Doheny State Beach is taking place at 8:45PM. There will be a full day of events at the beach starting from 6AM till 10PM! 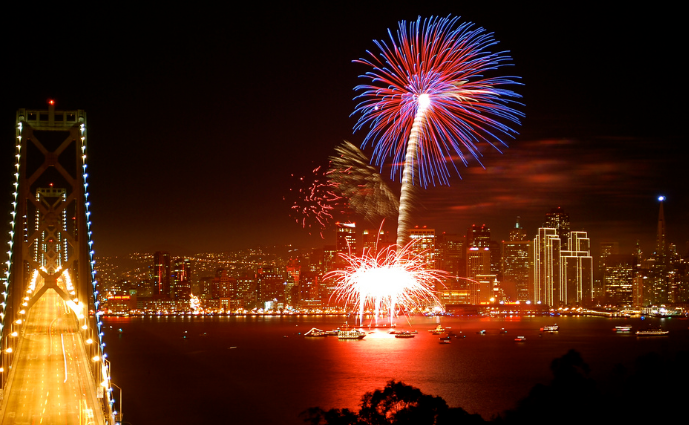 NEW Avalon: The Catalina Island Avalon Fourth of July Celebration is taking place from 1-9PM. The annual golf cart parade down Crescent Ave begins at 1PM. At 4PM the Avalon Bay Dinghy Parade starts. Fireworks will be shot off over Avalon Harbor at 9PM. NEW Huntington Beach: The Pier Plaza Festival is taking place at Huntington Beach Pier from 10-9PM. A parade consisting of bands, floats, celebrities and equestrians will be marching through downtown Huntington Beach. NEW Channel Islands Harbor: Channel Island Harbor is hosting Fireworks by the Sea which is an all-day 4th of July celebration including activities, entertainment, food, games, an artist's market and more! Maritime Museum of San Diego Independence Day festivities at The Embarcadero from 5-8:30PM on July 4th. Coronado Island from 5-9PM on July 4th. The 43rd Annual Independence Day 12K run-5K run/walk will be at Tidelands Park. There will be art in the Park, a concert and fireworks! Celebrate 4th of July watching the Big Bay Boom Fireworks show launched from four barges around the bay (Shelter Island, Harbor Island, The Embarcadero area and Seaport Village/Coronado Landing). Fireworks begin at 8PM!